Two spiders are hanging in the corner of my ceiling right now. Yesterday, Tim was the only one. I have named the new spider Laptop, after my sister. Tim and Laptop rarely move, yet the cobwebs never stop growing. Until I wake up one day and realize I’m dangling from the ceiling and that an army of spiders is about to turn my insides into goo and digest them, I will leave them to their spider ways and think about how their lifestyle is related to human dating. Spiders are repulsively patient. To my knowledge, Tim only moved once in the past two months. A tiny bug had flown into his carefully yet poorly located trap and Tim was eagerly cocooning it in thread, rubbing his limbs together greedily and saying “oh boy oh boy oh boy oh boy!” Except for that five minute movement-bender, he usually sits in the corner and does nothing except for think spider thoughts, which are too vile to record here. Though I can’t say it’s a boring and meaningless life, I will say it’s not the life that I’ve chosen for myself. There are some, however, who follow the spider’s way when attempting to snare a potential mate, friend with benefits (e.g. baked goods), or mother. The spider-mimicking-human, or SMH for short, expends only a minimal amount of effort when attempting to trap prey. Just like a real spider, the SMH is often truly interested in the prey, but he or she is simply unwilling to leave their wifi-outfitted cobweb corner. Instead, the SMH prefers to wait until the prey comes of its own accord. For this reason, the spider method only works if the prey has sufficient reason, motivation, or desire to visit the SMH’s web more than once, sometimes as a result of mutual friends, free food, or cuddly pets. After the prey has visited a few times, and the SMH has “a special feeling,” it’s time to pounce. Without warning, the SMH completely wraps him in SMH silk, making his escape impossible. The SMH then drags the prey to her room, where she will make him listen to songs that she likes on YouTube and discuss past relationships before she injects him with venom that turns his insides into goo and devours them noisily without using a utensil. The spider method of dating is not pretty and usually ends in disappointment for both sides. On the one hand, the prey is eaten, and on the other, the SMH has a hollow corpse that must be eliminated. For these reasons, the spider method is not a recommended way to date someone. It’s better to get their number and then do things together. Virtual relationships through gchat are also acceptable alternatives. Join us next time on Dating Tactics We Learned from Animals for our discussion of cardinals and blue jays! I only want my relationships through gchat. That way I can juggle a few at the same time. I google searched spiders in order to get that picture and got really creeped out just looking at all those photos. I kill all spiders. They will outlive us. We are outnumbered! Yes…….and now I am on their side. Tim, Laptop, you know what to do. Wow. I guess in some cases a fear of commitment may just be a strain of arachnophobia. There’s a million ways to look at everything. Just wait until the upcoming installments of this series, if there are going to be any. Used to have a bedroom at ground level. Kept a spider to catch all those little bugs that got through the screen. He/she was well-fed. Also had a three foot garden snake in residence in the high grass the mower couldn’t reach. The animals are our friends. All of those children’s books weren’t lying to us—they need to have more on the positive side of creatures that aren’t puppies or kitties. I’m a Tim, but I’m a human. I have the dating tactics of a SMH. This post is an eerily full-circle type of moment for me. Dum dum dum……………….you’ve met your alter and it is arachnid. Thank you for withholding the vile spider thoughts. (I’m still having nightmares about running out of poptarts.) Couldn’t handle the working of the arachnid mind….but I bet they are sadists. You wouldn’t even believe the half of it. All those eyes see some pretty disgusting things. I’d make a comment but spiders ate my keyboard. Gah! Are you still there? Oh god you’re gone aren’t you….what is your blog going to do??? I’m actually outsourcing to the spiders. They’re pretty good writers! The web of monogamy is a trap all its own…..to be posted about later. I certainly did consider talking about the praying mantis. Just need to meet a wider circle of female friends for research. Thanks a lot—-I really appreciate it! 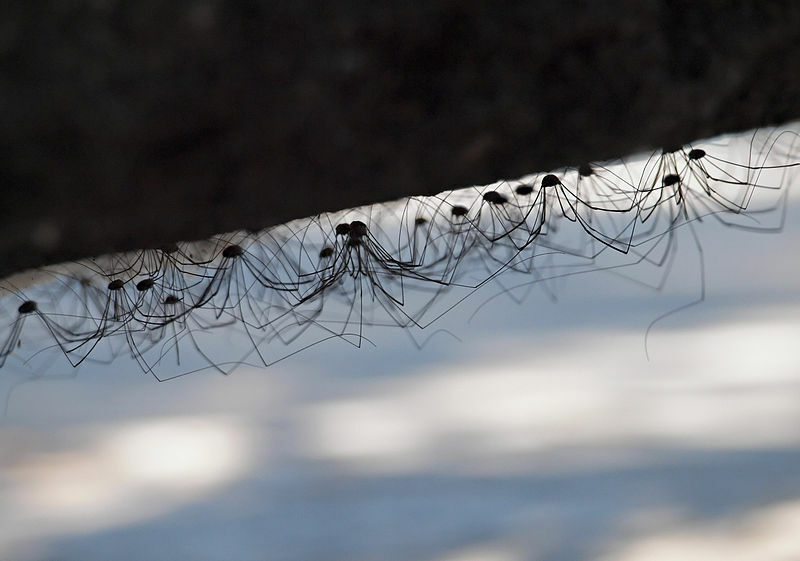 I had daddy long leg spiders hanging over my bed when I was a kid. I named them also. I liked them, but they did have a habit of dropping the wrapped up corpses of their prey into my mouth when I was sleeping. Yeah I can definitely see the comparison of listening to bad songs on youtube to spider bites. Except carly rae jepsen isn’t quite as scary. I’d say a good 75% of YouTube is more scary than a spider bite. And there’s no question as to what’s more depressing.